In this Football Manager 2018 experiment, we have placed a 32-year-old Alex Ferguson into FM18 to see how he’ll progress. If you missed the previous post in this series, do go back and see how Ferguson left an Athletic in Scotland to join an Athletic in England. 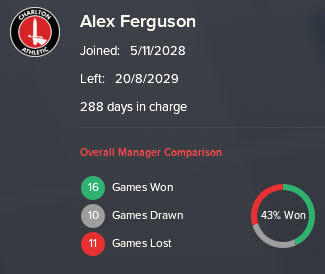 In this post, we will review the next three seasons in Alex Ferguson’s career as he moves on from Charlton after just six months in charge! In the previous part we saw Ferguson leave Annan Athletic for Charlton Athletic. He went on to perform very well for Charlton and led them to a playoff final, where his side was beaten on penalties. This performance, albeit in a losing cause, raised Ferguson’s reputation enough to attract interest from top-tier Scottish teams. Dundee approached Ferguson to become their manager in August, just a couple of games into the English League Two season. Fergie could not turn down this opportunity and left Charlton after just 10 months in charge. Dundee were predicted to finish 6th in the 2029-30 season and Ferguson led them to a 6th place finish. His new side ended 14 points behind 5th, a huge gap that Ferguson will be looking to reduce in the coming seasons. An agonisingly close Scottish Cup final saw Dundee lost out to Hibernian after extra time. 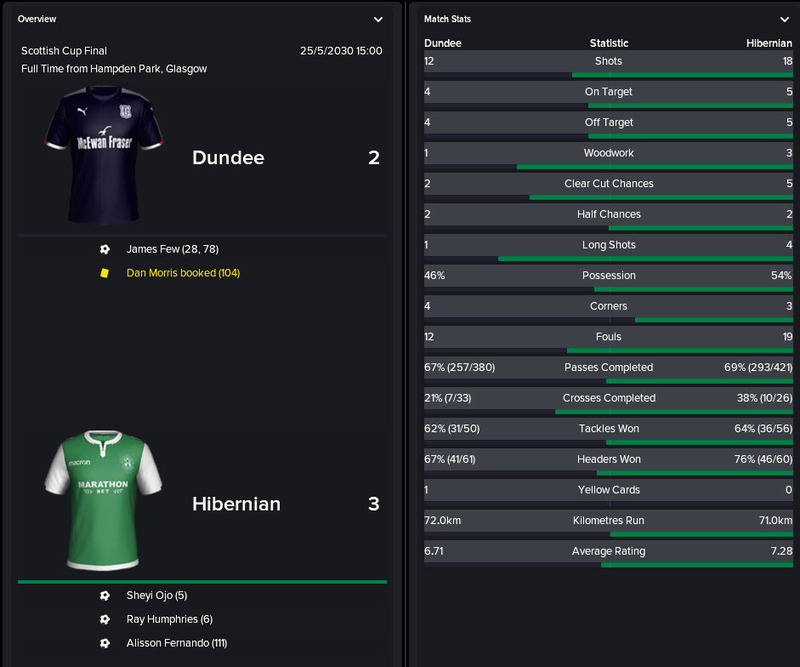 Hibs led 2-0 after 6 minutes but Dundee fought back well to end 2-2 after 90 minutes but they couldn’t add to their tally as Hibernian scored in the 111th minute. Dundee improved significantly this season as they finished 1 place higher with 15 more points. The gap seen last season has evaporated and Ferguson’s team now sit just 5 points behind Rangers in 3rd. Celtic dominated the league season and ended with 90 points, 17 points ahead of nearest challengers Hibernian. The 2031-32 season saw Alex Ferguson lift his Dundee side to a great finish of 3rd in the SPL, finishing behind Hibernian (on goal difference) and champions Celtic. Again Dundee were predicted to finish 6th and so this shows how well the side have progressed under Fergie. It’s quite nice to see this linear progression over the three seasons. Will the trend continue next season? Can Fergie and his team challenge for the SPL title? 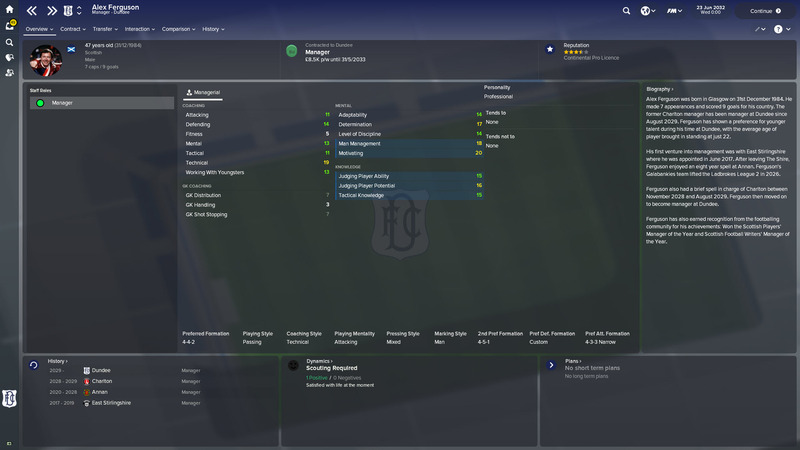 After three successful years with Dundee, Ferguson’s statistics have improved to now give him an overall 40% win percentage from over 600 matches in management. With Dundee, Fergie has an impressive win percentage of 49% from his three seasons at the club. The three decent seasons with Dundee are shown in the table above. It will be interesting to see where Dundee will be predicted to finish next season after the impressive 3rd place from the most recent season. Ferguson’s ability has continued to improve, as has his reputation. The move from Charlton to Dundee saw his reputation rise significantly and it has slowly risen in the seasons since. If you liked this post, please do leave your feedback in the comments! 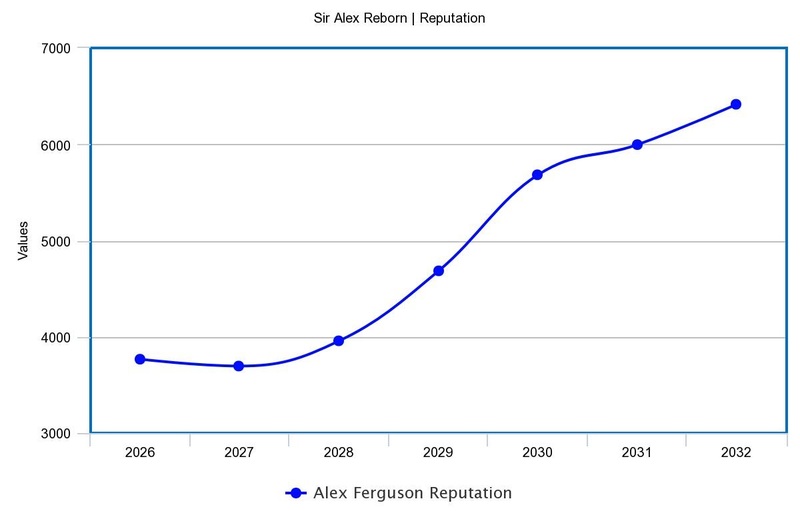 Now in the Scottish Premiership and European competitions, Ferguson’s reputation has grown significantly. It will surely be only a matter of time before an English Premier League side takes notice? 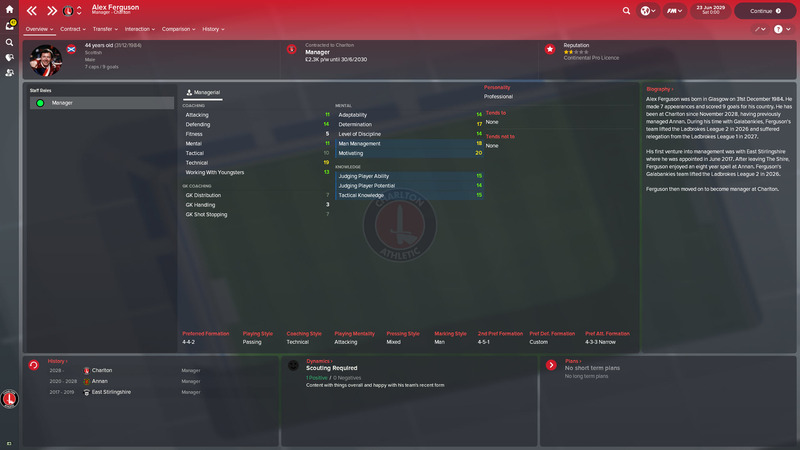 This entry was posted in FM Experiments | Sir Alex Reborn, FM18 Guides, Experiments & Wonderkids, Football Manager 2018 and tagged alex ferguson, charlton, dundee, england, english league two, europa league, fm18, football manager, scotland, scottish cup, scottish premiership. Bookmark the permalink.